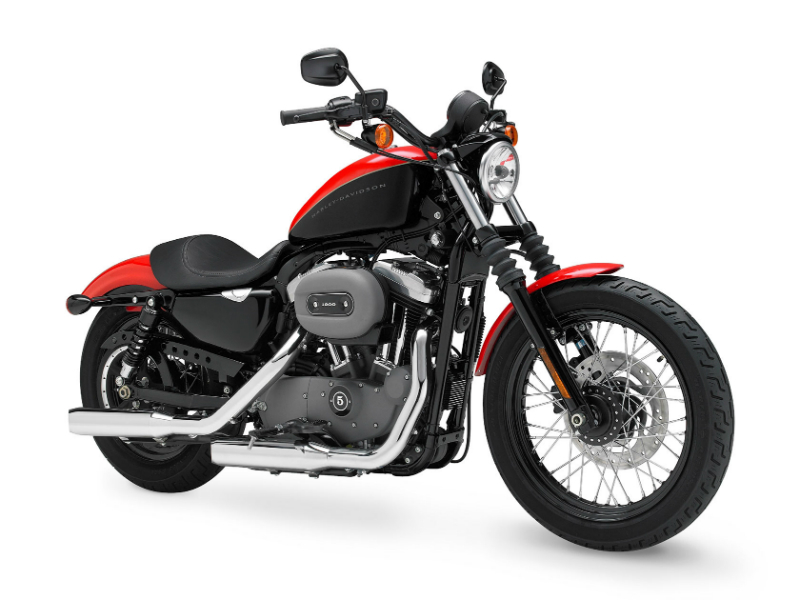 The Harley Davidson Nightster is a harsh looking 1200 cc cruiser with sports appeal. Read this review to find out its features, specifications and price in India. One of the prominent models that came as an output when Harley Davison brought the comfortable riding posture of a cruise to build a sportster was Nightster. The 1200cc bike which has most of its body coated in black and gray with a black coated belt guard that has lightening holes and a black and straight handle bar suitable for drag race. The indicators at the rear are multifunctional acting as brake lights, engine running lights and indicate turns as well. One of the silencers run half way of the other and both of them are chrome plated which makes it attractive along with rocker block with most other parts like engine cylinders and fins and transmission being in either black or gray. A 1202 cc air cooled engine that has its cylinder head and the cylinder itself made of aluminum alloy makes this engine efficient by weight and also by thermal conductivity. The engine is called Evolution engine and has one cam lobe to actuate each valve and they are run by cam shafts. An Electronic Sequential Port Fuel Injection system injects fuel in pulses into the cylinders. The engine gives out a maximum torque of 98 Nm at 3200 rpm. This torque is at low rpm peaks the bike to top speeds by accelerating swiftly. The engine has the camshaft assembly below the cylinders and hence uses a push rod and rocker arm assembly to transfer the motion of the cam lobes and actuate the inlet and exhaust ports. The transmission unit and some parts of the engine are gray in colour while the fins and the cylinder of the engine is coated black. The rocker box, exhaust silencers and the push rod assembly is chrome coated with one of the silencers running half way to the other. The petrol tank is at slightly elevated height and the drag handle bar is designed in a manner to suit a forward lean ride with an aerodynamic riding posture. The peanut shape fuel tank runs along an inclination from the handle bar towards the rider. The handle bar, front fork and the fork cover, the head lamp cover, the front and rear fenders are all coated in black. The foot pedal of the rider is offset to a small extent compared to other cruise models of the brand. This is to suite the sporty riding experience of the bike. The 260 kg Nightster has a 39 mm telescopic fork at front and preload adjustable coil springs at rear for better handling and riding comfort. It is a single seater bike with Michelin tyres at front and rear. The tyres have deep cut treads for better road grip of the bike. The rear tires have certain angled belts made of aramid fiber. The front and rear wheels have discs that use dual piston calipers and single piston caliper for braking. The tires are designed for speeds up to 210 km/hr. 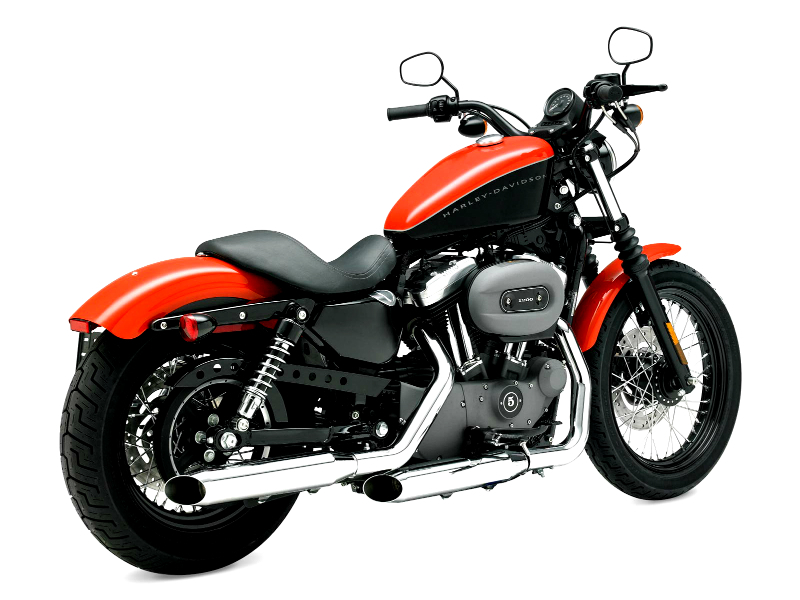 The Harley Davidson Nightster is expected to give a mileage of about 20 to 24 kms per litre of petrol. 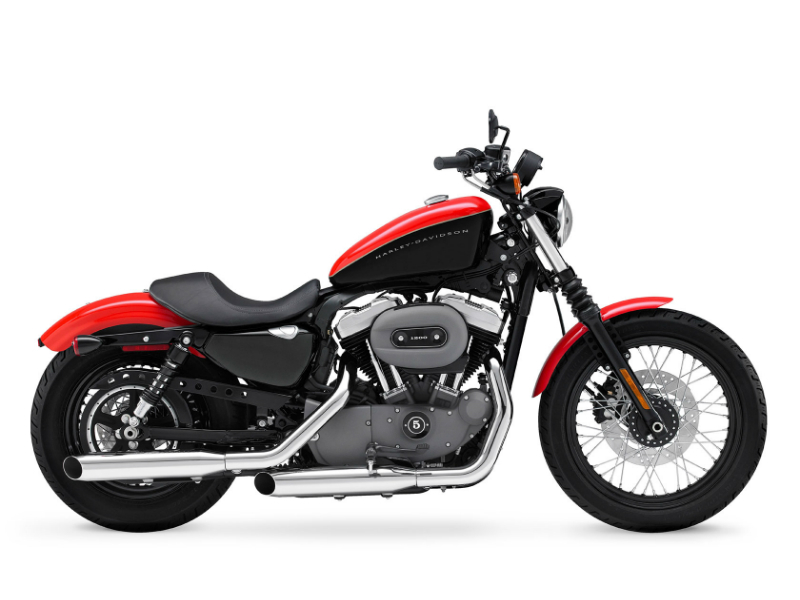 Harley Davidson Nightster costs about Rs 10,10,000 at New Delhi. The bike is available in Vivid Black and Black ice denim colors.